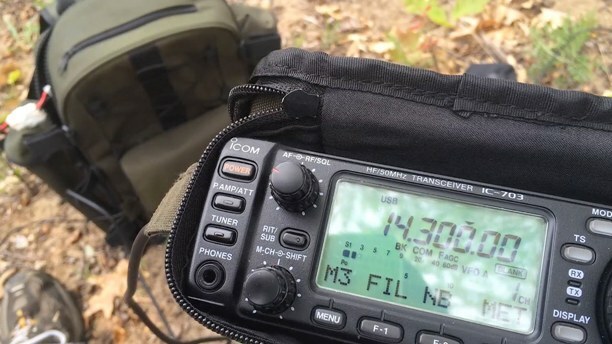 Many DA-RC members believe that both QRP operating and QRP contests, on ham and 11m frequencies, will be the new craze when the next cycle eventually kicks in. For those of you who’ve been living with their head shoved in a haystack, the term QRP refers to “operating at extremely low power of about 10 watts” and is rather attractive in DX circles due to the challenges it poses in terms of workability. 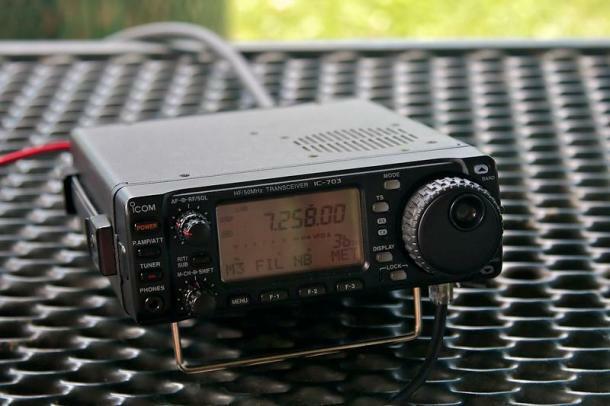 A while ago I purchased an ICOM IC-703 on eBay for a bargain price especially for this purpose, but also to use on the legal band allocation which is just about to take off incidentally with CB Club action! As you can see, this radio looks just like the IC-706 but it only puts out a maximum of 10 watts! So why would I want this one when I’ve got the Kenwood TS2000 already on the shack bench? Well, like I said before, I like the concept of QRP, this radio is made for it as it requires no further adjustments like tuning into the menu and turning down the power and, of course, the price was darned good, lol! Although I’ve only had this rig for a short while, I can already say that the IC-703 is a beaut little radio with a terrific receiver. 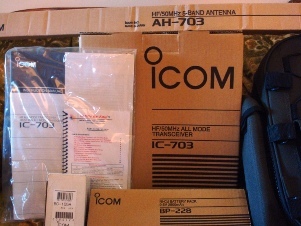 At just two kilograms, it is most definitely not an IC-706MkIIG with a 10W PA as some people assume and has its own unique characteristics. The receiver for instance, which is completely redesigned, has a much quieter front end. It’s extremely sensitive and the RX audio quality is excellent for SSB. You can definitely pull out the weak ones with this radio as I’m finding out by comparing reports with other ops in the local area. Surprisingly, the internal antenna tuner works far better than I would have expected and just as well as my Pro 2 antenna tuner does. It certainly tunes a wider range than specified by ICOM! 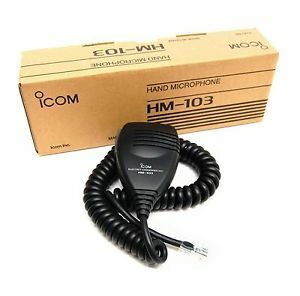 On the TX side of things, audio reports from some of the local ops are quite good as well using just the standard ICOM microphone with its connector 8-pin modular jack. The optional BP-228 battery I’ve been using is fairly small and light but it will run the radio at a solid 5W out for a reasonable period of time. Having previously owned the idiosyncratic Yaesu FT-100, I was well prepared for navigating the menus of the IC-703 and, for a technical idiot, I actually found the Menus and Operation Guide very easy to get my head around. The front panel is simple to understand, even with the menu system power consumption on low, but it would’ve been tops to have had a built in clock. You can’t have everything though or you’d be getting up in size and price and that would defeat the purpose of the radio in the first place. My choice of power supply was of all things the PS/Speaker made to match the 10m Emperor TS-5010. The colour scheme matched perfectly and the 703 sits snugly on top of it. 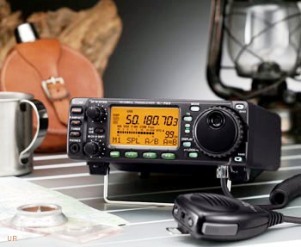 With USB, LSB, CW, RTTY, AM and FM modes, the IC-703 seems to be well built and it’s a really cool rig to own, but there are a few things that do not appeal. Firstly, the connector for the DC PS seemed a bit iffy so we’ll have to see how it holds up. Secondly, I wasn’t keen on the microphone connection at the bottom of the rig. If this is the way they want it, they should have made the ‘Feet’ a fraction taller so that the microphone connector didn’t bind so much. When I use the headphones also, it is very difficult to use the IF-SHIFT knob. 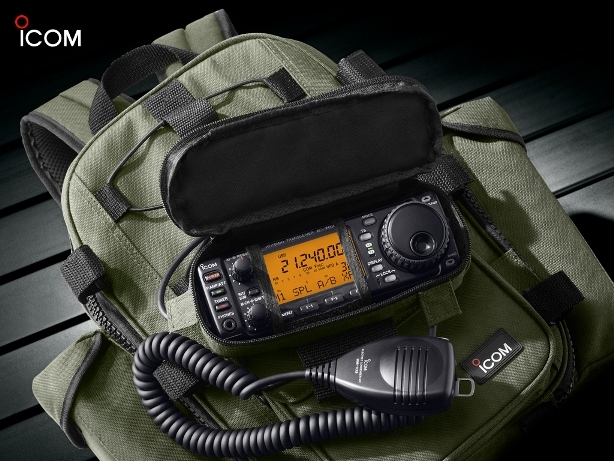 My overall feeling is that the IC-703 is very versatile and very functional for QRP operating. As fas I’m concerned, performance is better than any other radio this small – or that I have used anyway. Power consumption, too, is very reasonable for such a feature rich radio (3A max for 10W out, 2A @ 9/6V for 5W out with the BP-228). HI im looking a a 703 that came up for sale with ATU built in what do u think of the ATU good enough for end fed 20m and 40m ops in bush? I agree it’s a brilliant rig for field ops but its excellent receiver makes it a great base radio.